Blue light emergency phones are intended to act as an additional security precaution in public areas. By having these highly visible, and easily accessible blue light phones, the community is continually reassured that they can summon police assistance immediately. Unlike cell phones, the dispatch center will automatically know where the call is coming from and quickly dispatch an officer to the exact location. At night a blue light atop the phone is automatically lit making them easily visible from long distances. The blue light phone tower was developed for use on college campuses, hospital sites, and high-traffic areas. It has become one of our most popular towers to date at many universities across the United States. The emergency phones are activated by pressing the large red button on the front pannel, which will automatically call the Dispatch Center. At the same time, a high-intensity strobe light at the top of the phone will activate, providing a beacon for the police or firefighters to locate the person in distress. This emergency call box is designed for wall/pole mounting. It is constructed of stainless steel, 42 inches high, 4¾ inches wide and 4¾ inches deep. It also has camera-ready relay and mounting studs, a 1,000,000 candlepower blue strobe, a white area light, and an optional voice call location identifier. In addition, this blue light emergency phone can be used with an Intercom System to control up to 30 stations without outside telephone lines. This emergency phone is a handsfree telephone emergency autodialer. At the press of a button, the unit dials a primary telephone number. If the number is busy or does not answer, the call box will hang up and dial up to nine 'backup' numbers. A call progress lamp is provided on the front of the unit for the benefit of the hearing impaired. When the CALL button is pressed, the lamp flashes to indicate a call is being placed. When the call is answered, and the unit recognizes that someone is speaking to the unit, the lamp glows continuously. Emergency phones for public areas. 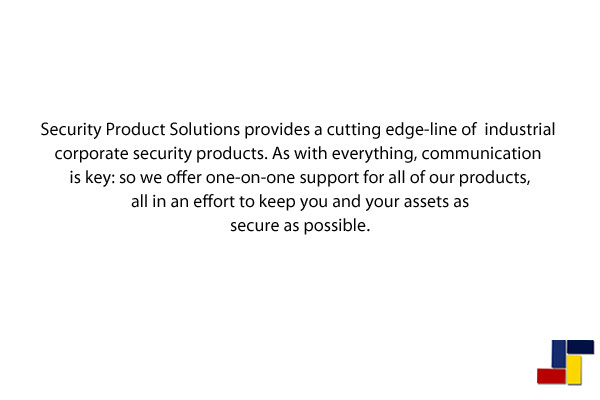 Security/Help telephone for parking structures. "Area of rescue" telephone for high-rise buildings needing ADA compliance. A blue light emergency phone in the form of a compact wall mount. It has a triangular construction, 1/8 inch powder-coated steel, 38 or 56 inches high and 11 inches on each side. It comes with a combination blue light and blue area light, an optional voice call location identifier and camera ready. 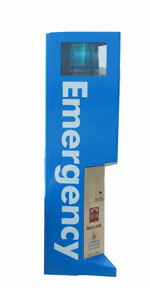 A blue light emergency phone in the form of a ground pedestal. It has a triangular construction, 60 inches high and 11 inches on each side. An aesthetic design used to keep high traffic areas secure in case of an incident. Over the past decade, you may have noticed the implementation of emergency phones throughout many mass-transit locations worldwide. These devices connect callers directly to a dispatch center, who will then notify the appropriate authorities to respond to the situation. They often go unnoticed unless you find yourself in a situation where you need the use one of these communication units, because in a time of danger, they can act as an efficient and effective crisis management solution. The phones are engaged by pressing the red button located on the front of the unit, which automatically calls a pre-determined number. Meanwhile, a high-intensity blue strobe light located on top of the unit is alarmed acting as a signal for police or potential help to locate the area of need. The called party can only end the call, and if for some reason the call is busy or goes unanswered, the emergency phones will automatically hang up and dial up to ten pre-programmed numbers. There are a plethora of different aspects that must be considered when implementing a total campus security plan. Our emergency phones are ideally suited to meet the high demands of the complex campus surroundings. Whether located throughout a campus grounds, or in parking lots and garages, emergency phones can provide a cost-effective method for maintaining the safety of students and staff. They also abide and promote the conditions stated in both the Jeanne Clery Act and Higher Education Opportunity Act. Copyright © 2012 Destined Commodities Inc. All rights reserved. and we can help you find a blue light phone system that can effectively fit your needs.